New York Police Commissioner Howard Safir, Left, Greets Gavin Macleod, A.K.A. 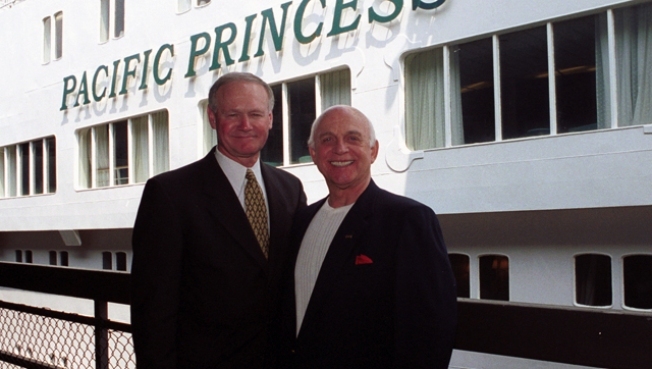 Captain Stubing Of "The Love Boat" Television Series, May 7, 2000 In New York City In Front Of The Original Love Boat, The Pacific Princess. Everything Aaron Spelling touched turned to gold – or gold lamé if you were a fan of “Dynasty.” That Midas touch apparently rubbed off on his underlings, as a former business partner is offering up his 130-acre enclave in Roxbury for $9.3 million, according to the Wall Street Journal. The owner of the property is Douglas S. Cramer, Spelling’s former business partner and he's credited with “Dynasty” and the “Love Boat.” He's known as one of the most successful producers in the history of television, according to Internet Movie Database. For those who weren’t around when those shows were on and have not watched them online or on cable, those were hits of the day, equivalent to “Gossip Girl,” or a TV-spin-off of the Twilight books. Cramer also worked on the "Brady Bunch", "Mission Impossible" and "The Odd Couple." The house – the main one -- is 11,000 square feet and has a wine cellar. He bought the property, known as Dogwood Farm, 15 years ago and added nine adjacent properties, including an art barn, party barn, a dam and three bridges. Cramer's worth was estimated at $300 million, which explains how he can afford the major expansion. His modern art collection, worth $100 million, is among the largest in the world, according to IMBD. Carolyn Klemm, of Klemm Real Estate in Litchfield County, has the listing.